Penang is one of the smallest Malaysian states and is split into two – an island and mainland area. Being one of the most developed regions in the country, the capital of this state, George Town is also a UNESCO World Heritage Site. Penang is a paradise for all food lovers and due to its cultural and ethnic diversity, the food here is assorted as well. The popular dishes here are mainly from Chinese, Indian, Malaysian and Western cuisines, many of which have been tweaked and fused to create more innovative dishes. You can find some of the most authentic dishes by the street here and it is actually difficult to decide the ones that stand out. If you’re heading to Penang, do go to the streets and explore these fine dishes. The most common dish in the city of Penang is the Char Koay Teow, which is basically stir fried rice cake strips. The noodles are fried in pork fat and to this prawns, Chinese sausages, sprouts and eggs are added. In each morsel, the flavors burst in your mouth and give you an out-worldly experience that will make you an instant fan. Traditionally called Oh Chien, this dish is made from raw oysters that are fried in egg and rice flour batter and served with fiery chilli sauce that complements the flavor of the oysters perfectly. This fluffy omelette is a favorite among all egg and oyster lovers and if you’re one too, there is no reason to not like this dish. This is a soup that includes boiled slices of pork, fish balls, and cake served with rice noodles. The broth is boiled from chicken or pork bones to give additional flavor. It is topped with red chilies dipped in vinegar or lime. The soup is flavorsome and zesty – a definite winner for all meat lovers. It can also be made using duck meat and a dry version of this dish can be ordered as well. This soup is made by combining curry and coconut milk. Noodles and rice vermicelli are added to it with fried bean curd, cockles, prawns, cuttlefish and bean sprouts. You can also add cubes of pig’s blood to it for added taste. The taste is similar to the traditional coconut laksa, which is popular in other Asian countries. This dish may have the Indian state of Assam in its name but is a signature creation of Penang. This fish based soup is made with tamarind juice, chilli paste, lemongrass and is topped with prawn paste. The tangy flavor of tamarind is the highlight of this dish and those who love it will become instant fans of this dish. The Penang Rojak is a salad made from bean curds, bean sprouts, cuttlefish and a variety of fruits. It is topped with peanut sauce that gives it a smooth feel. These fruits and veggies combine to give delightful bursts of juices that fill your mouth and will widen your eyes in surprise. This Indian dish has found its way into Malaysia and can be found in George Town. You can relish the soft and succulent chicken cooked in tandoor with freshly cooked bread. Indian food can be found in Little India area of George Town, which is filled with Indian stores and restaurants. Tandoori Chicken has won hearts of millions around the world and will surely win yours too! This noodle based Indian Muslim dish has generous servings of cuttlefish, potatoes and bean sprouts. It is stir fried in tomato, chilli and soy sauce to give added flavors that bring the ‘wow’ factor to it. The tangy flavors of this dish and serving sizes have made it a popular food item in Penang. This one’s for the sweet lovers. Penang Teochew Chendul is a dessert made from red beans, coconut milk and brown sugar syrup, which are added to shaved ice and topped with green rice flour jelly (chendul). The cooling dessert is indeed a savior from summer heat and is a delight to eat. Lok Lok consists of skewered meat and vegetables in a hot pot. This is a unique dish where you can pick skewers up and cook them in a large pot with boiling water along with those of others. You can then go ahead and add sauces to the cooked food and enjoy your meal. Trying out this dish is fun as it gives you a feel of cooking it as well with everyone else! 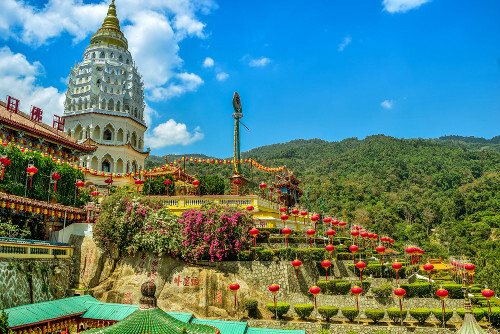 The best part about Penang is that you can find a wide variety of food which is not only limited to traditional Malaysian dishes but also has elements from other cuisines. This is probably the reason why Penang is called the ‘Food Capital of Malaysia’ and draws thousands of foodies every year.